Happy New Year! I'm back to work and blogging today and it's quite the rude awakening. I hope you all had an amazing Christmas and new years, and got to enjoy some time off with people you love. We got back from Utah at about 3:30am Sunday morning (and slept most of the day after), so I wanted to post this outfit while it was still recent. I never thought I would be styling snow boots on my blog, but here we are. For our trip I actually packed very minimally (shocking to all of our family and friends) and only brought two pairs of shoes - these snow boots and a dressy OTK boot - and two sweaters. It was a little painful for me, but it actually worked out really well. Once we got to Park City I quickly realized that snow boots are what everyone wears (even out to restaurants & bars) because there is truly so much snow! Trey and I both splurged on Sorel boots for this trip, and there wasn't a moment we regretted it. They're completely waterproof and so warm, and I love that they can still be integrated into a cute outfit! I went with black over the traditional camel/cognac options because I felt like it was a little more "me" and less traditional/preppy. I was also so glad I packed this oversized, chunky turtleneck sweater! 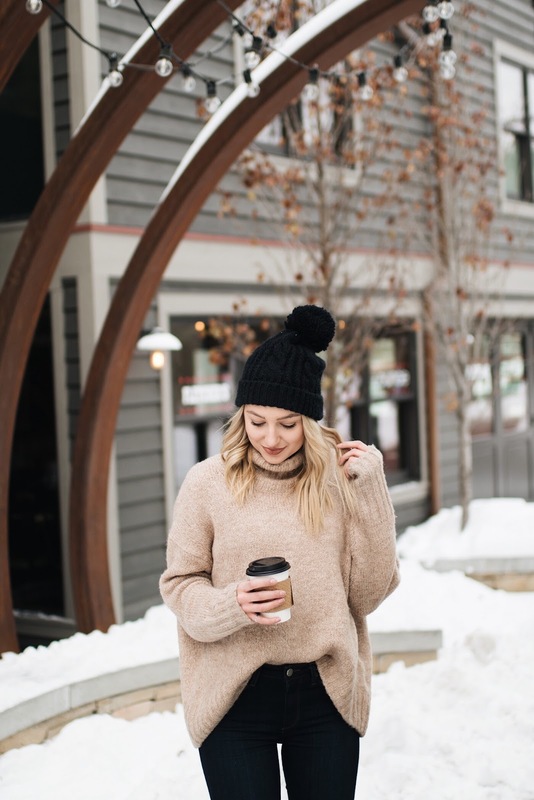 These are an absolutely must for cold weather or any kind of ski trip, and I like that a) you can layer underneath without it being obvious and b) they're so effortless to style. Mine is from H&M and I've seen them in stock in several colors at multiple H&Ms recently. I highly recommend it! Tomorrow I'll be sharing lots of photos from our trip, so make sure to check back in!